Whether it's splotched, patchy or completely covered, a lawn choked with ugly weeds can be a homeowner's worst nightmare. Fortunately, there are steps you can take to transform an awful lawn into an awesome one that's thick, green and weed-free. Any plant that is unwanted is considered a weed. Many plants earn their weedy reputation because of their aggressive reproduction systems. Some of the worst weeds proliferate so quickly that they can overtake a lawn in just a season or two. The first step in reclaiming a lawn is mowing because it strengthens the grass by forcing it to grow more vigorously to get the water and energy it needs. This helps the grass grow stronger so it can push back against invading weeds. Before mowing, set your mower to a higher cut height. By leaving grass longer, you allow it to retain more water, plus the height of the grass blades helps shade the ground underneath to protect roots, limit evaporation and stop weed seeds from reaching the soil. How high to leave the grass varies according to grass type, but always follow the rule of thirds: Never cut more than one-third of the blade height off per mowing. Mowing sets the stage for attacking the weeds directly. One of the best ways to encourage vigorous grass growth is to water regularly. Try to water early in the day because this helps ensure water doesn't evaporate and gives grass adequate time to soak up the H2O before peak sun periods. Strive to water deeply, penetrating the ground 6-8 inches, to build strong, drought-tolerant roots. Keep in mind, a healthy lawn needs about an inch of water per week to stay strong. Use a selective weed killer to knock out the weeds that are choking your lawn. Preen Lawn Weed Control kills more than 200 types of tough lawn weeds down to the roots. This product kills just the weeds, not the grass. 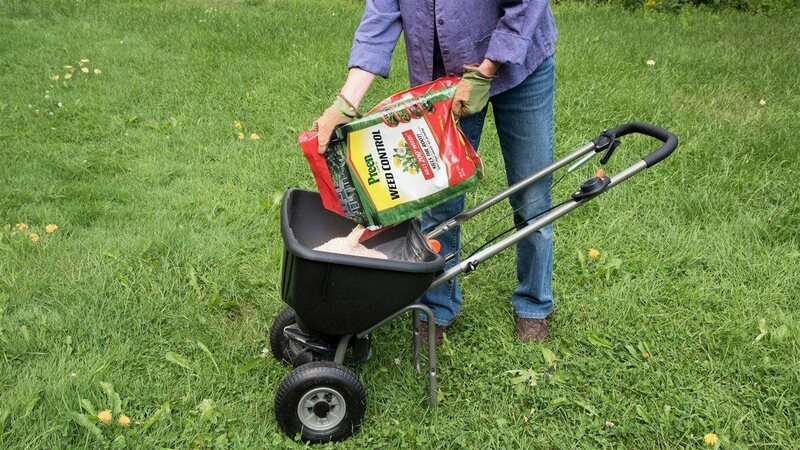 Unlike a weed and feed, it doesn't contain fertilizer, so you can use it any time weeds are growing without worrying about burning your lawn, even if you've just fertilized with another product. Treat the whole lawn or just spot treat the weedy patches. Apply it when the grass is wet, so the granules stick to the weed leaves, which absorb the active ingredient and send it down to the roots. The weeds it treats should begin to shrivel and die over the next week or two. For seriously weedy lawns, it's OK to reapply in 30 days, if needed. After weeds have been knocked out, it’s time to build up your lawn so it can take care of itself. Continue your mowing and watering regimen and begin a feeding program. Lawns recovering from weed problems are stressed out, so avoid high-nitrogen lawn fertilizers at first and instead use a balanced formula designed to help recovering lawns such as Turf Nurture. This routine will help the grass spread to bare spots left by dead weeds and begin to build a beautiful lawn. Don't settle for an awful weed-covered lawn all season long. With a few simple steps you can win the war on weeds and get the strong, lush lawn you want.